Lock in a great price for Four Points by Sheraton Columbus Airport – rated 8.3 by recent guests! The staff was so friendly from the moment we walked in the room. I am so picky about hotels and the cleanliness, however when we walked into the room it smelled fresh. The entire hotel was clean. Very close to the airport, free parking, and free shuttle to the airport. Very convenient and very nice! Beautiful, clean and amazing customer service. 24hr complementary coffee and tea. Wendy’s, jimmy John and Tim Horton’s at the base of the parking lot. We traveled there for the Arnold classic bodybuilding competition. The location was between 7-10 mins away from everything. Was worth the price. Will stay again! Very clean and convenient to airport. Bed and room where very comfortable. Staff was friendly and helpful. Well locate with easy access to I270 and Easton Town Center. Staff was friendly and helpful , location was great ! The rooms were spacious. The staff was very accommodating, I needed milk for my cereal. The staff gave me a cup even though I was willing to pay for it. The first room I was given had a few piece of hair on it, I was moved immediately. Water pressure in shower was fabulous and bedding was so cozy. My stay was decent. I expected a little more for the money. By, far the best hotel I have stayed at in Columbus. Very comfortable bed. It was clean. Staff was friendly. Close to where we needed to be. Four Points by Sheraton Columbus Airport This rating is a reflection of how the property compares to the industry standard when it comes to price, facilities and services available. It's based on a self-evaluation by the property. Use this rating to help choose your stay! One of our best sellers in Columbus! 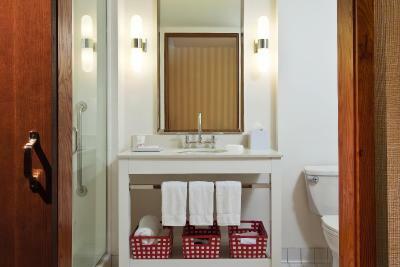 This Columbus hotel is a 10 minute drive from Central Columbus and Ohio State University. The Sheraton Four Points offers an indoor heated pool, 24-hour gym and rooms with free Wi-Fi. 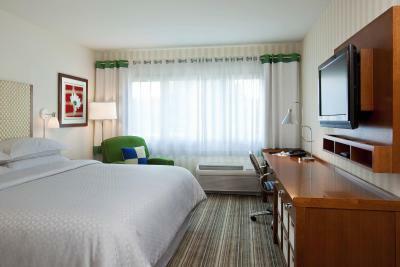 Four Points by Sheraton Columbus guest rooms are spacious and furnished with a work desk and lounge chair. A flat-screen cable TV, coffee-making facilities and free bottles of water are included. The on-site cafe and restaurant serves a buffet breakfast and a full menu for dinner. A bar is open in the evening. Guests at the Columbus Four Points Sheraton have free access to the 24-hour business center. Free airport shuttle service to the Port Columbus Airport is provided and a convenience store is on site. Franklin Park Conservatory is a 5 minute drive from the Four Points Columbus Sheraton. The Columbus Convention Center and Nationwide Sports Arena are 10 minutes away. When would you like to stay at Four Points by Sheraton Columbus Airport? House Rules Four Points by Sheraton Columbus Airport takes special requests – add in the next step! Four Points by Sheraton Columbus Airport accepts these cards and reserves the right to temporarily hold an amount prior to arrival. The breakfast is over priced for what you get. The 6:30 breakfast staff doesn't arrive until 6:30 so it's more like a 6:45 0r 7:00 breakfast. While the hotel was updated in the last few years it looks unfinished. The tile in the bathroom is the incorrect type, no trim molding around the bathroom door and there isn't any transitions in the flooring in the room. The shower faucet is hard to control the temperature and shut off as there aren't any stops in the faucet. Having a restaurant in the hotel is nice. The rooms are always clean. Wasp in the room. Trash on the floor and a cobweb on the heating unit by the floor. Rooms were advertised as sound proof but they weren’t. No microwave or fridge in rooms. The fitness center only had a bike, a treadmill and a bench. No leisure room outside of the room that kids were allowed in. Room flooring and bed headboard needs updated. Well, the dining room was closed so we didn't get the complimentary breakfast, which we were looking forward to. We had a disappointing sandwhich at Tim Horton's instead. The lobby was nice and cozy, but the coffee bar was not stocked and there was no trash bin by the coffee station.